Equipped with intelligent features and systems, the LG DLEX3001W serves the user with precise temperatures, true steam, and 9 drying programs and 10 options. This dryer model comes with convenience and safety features that assure the user of its user-friendliness, safeness and reliability. The Steam Sanitary cycle should provide this dryer the hygienic factor that most users are looking for in their household appliances. The LG DLEX3001W operates with the Sensor Dry System. With this system, the appliance detects just how dry or moist the garments in the load are. It makes use of this knowledge by setting the appropriate drying times and temperatures. The SteamFresh cycle is a great way to prepare clothes without having to iron, rewash stored clothes or to wait a long time. In just 20 minutes, up to 5 garments of the userís choice will be clean-smelling, fresh, dry and wrinkle-free. This cycle is recommended to those who are always on the go. While the SteamFresh cycle can provide speedy freshening up for clothes that have not been worn for ages, the SteamSanitary option can sanitize garments, childrenís toys, infantís clothes and even non-washable items. This option is similar to the EasyIron option and SteamFresh cycle in that it reduces or sometimes even does away with ironing time. With 9 drying programs, 10 options and 5 temperature levels, the LG DLEX3001W should provide the perfect setting for each user. The intelligent controls and blue LCD display and dial-a-cycle knob provide the LG DLEX3001W with both user-friendliness and sophisticated design. The rest of the exterior points to understated but elegant design using durable materials. 7.4 cubic feet of capacity will speed up the userís drying chore. Each load will be worth the energy used. However, the SteamFresh cycle can only accommodate 5 garments at a time, which is just enough for someone freshening an outfit to wear. The accommodating drum is made of NeveRust stainless steel, which makes it sturdy and rust-free. 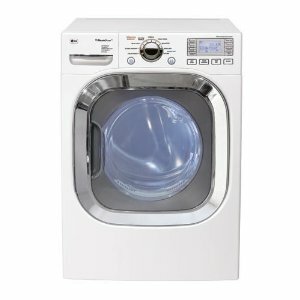 The LG DLEX3001W dryer is stackable with a matching washer. The consumer can save space by using an LG washer that is compatible with this dryer model. The reversible door has a glass center and a chrome rim. This makes for elegant but sturdy choice of materials. The LG DLEX3001W dryer is also available in pure silver and wild cherry. There is a one year limited warranty on parts and labor attached to this LG appliance. The appliance is also made of durable materials. So, the warranty is purely given for just-in-case scenarios. There is a drum light and child lock system to ensure that the user and his children will be safe whether the appliance is on or not. The dryer operates quietly, thanks to the LoDecibel Quiet Operation system. The product is not ADA approved. So, it cannot be used by the disabled without assistance. It is not energy efficient enough to be Energy Star certified.